Yes, a military coup apparently took place about two weeks ago now in Thailand. Arriving at Suvarnabhumi Airport in Bangkok at 11 PM at night, you would never know the military was in charge of the government, especially if this was your first trip to Thailand. This trip is not my first trip, it is my 10th. The differences are barely perceptible. The lack of the hustle and bustle that is the arrivals floor at the airport struck me the moment I left the confines of immigration and customs. The speed with which I passed through customs I attributed to arriving an hour earlier than my past trips. Or in retrospect, maybe immigration went faster because they aren’t scheduling very many late night planes in with the midnight to 4 AM curfew in place. Outside of customs and immigration, the usual swarm of people greeting family and friends was greatly diminished. The overall feeling was one of stillness. Exiting the airport, the sense of quiet continued. The traffic cop whistles and constant flow of bus, car and van engines passing through the departures and arrivals levels were strangely absent. Heading to the hotel a checkpoint on the road heading toward the airport was being set up, the night restaurants that are typically busy were nearly empty or closed, and only a few cars were on the road. One military truck was near the restaurants, I’m guessing they were actually just getting food before their shift of enforcing the curfew began. Life after the coup seems to just go on for most Thai. Leaving Bangkok and heading for Korat and Chet’s small hometown, the idea that there was a coup doesn’t even register. People are just going about their lives. Suvarnabumi airport was the meeting point for Tarn (our guide), Deborah and her son Jonah (ENP volunteers from New York), and Yo and Pim (Chet and Tarn’s friends). From there the plan was to take a taxi to Mo Chit bus station and then a bus to Korat. That was the plan anyway. The six of us and our luggage piled into the taxi van, the girls sharing the front single seat and the four of us squished into the back seat. Lots of very adamant chatter ensued between the Thai passengers and our taxi driver. In the end it was put to us that we could (with some rearranging of the luggage and seating configuration) have the taxi driver take us all the way to Chet’s home for 500 bhat each. The main selling point being that it would be a shorter overall length of trip. So that is what we did. The driver pulled over into the merge point area between the 2-lane frontage road and the 4-lane highway. We piled out of the van and with traffic zooming by us on both sides and the rearranging began. Once everything had been redistributed as best as possible to provide some level of comfort, we were off. Four hours and three inexplicably long and interesting stops for gasoline later, we arrived at Chet’s village and home. 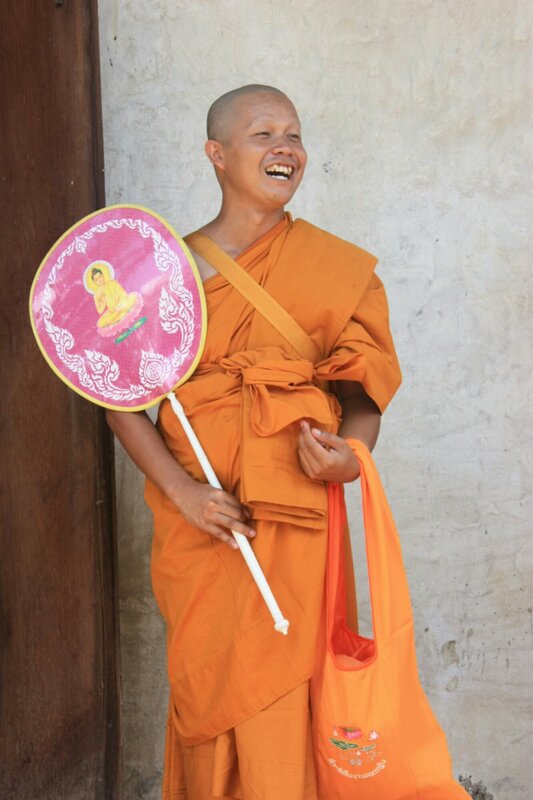 Every monk ceremony is slightly different depending on the traditions of the village, the region of the country and the individual becoming a monk. Regardless of the nuances, all of the ceremonies have two distinct parts. Part one is about purification and preparation. Part two is the transition to becoming a monk. Sometimes the ceremony takes place all in one day, sometimes the ceremony is divided over two days. The ceremony is paid for by the individual becoming a monk. Often the young man will save up for a long time to be able to pay for the food, gifts for the monks, and everything else involved in the ceremony. It is not uncommon for relatives or friends to hold their ceremonies at the same time to help defray the costs. Chet offered to share his ceremony with his nephew. About two weeks before the ceremony, his nephew decided to accept the offer. After a night’s rest on a mattress that gives a tile floor a run for its money for firmness, it was off to Chet’s house at the early hour of 6 am for the first part of the ceremony. Symbolic of Buddha cutting his princely locks and renouncing his life of privilege, the ceremony began with the cutting of Chet’s hair and shaving of his head and eyebrows (and a few other stray facial hairs.) Each person takes three cuts of hair, starting with mother, father, grandfather, elders, family and eventually friends. By the time I got my chance, it was hard to find much hair to cut. Once the cutting is done, all of the remaining hair was diligently and carefully shaved. After being rinsed, Chet changed into an outfit of a white shirt, a deep maroon silk sarong tied with a large skein of blessing string tied around his waist and a white almost lace robe with gold trim. A garland of flowers and gold ribbon was placed around his neck and he was given the lotus flower and candle set he would have with him for most of the rest of the day’s activities. At this point, Chet is no longer considered man and is not yet considered monk, so he is called Naga. Then began the procession through the village. Dancers led the way with flowing hand movement, metered step-together-step pace and call and response cheers. The band brought up the rear with music blaring from the portable platform. Everyone else ambled somewhere in between, ebbing and flowing within the pack. Chet sheltered from the sun by the yellow canopied umbrella being carried by his friends somewhere in the middle. Along the way was water and whiskey to provide some relief from the heat and physical exertion. Dancing is a lovely way to interact with locals. A common language for communicating despite any difference in languages. There was the lovely elder woman that kept dancing with me, encouraging more hip movements. Ket (one of the village women) was most encouraging about the dancing. My attempts to mimic her hand movements, which generally have significance in traditional dance in Thailand, brought smiles. Most of all it was sanook (fun). Sanook is very important to Thai life. If it isn’t fun, why do it. We danced our way through the village, all the way to the shrine at the entrance to the village. Reaching the shrine, we circled the shrine three times then paused while Chet and his nephew prayed and offered incense at the shrine. After the brief prayer and offering, the procession and dancing started again in earnest, heading back to Chet’s home for food and the next part of the ceremony. The next part of the purification and preparation process is to symbolically rinse away all of the bad things that had been done in their life. Cups of water infused with marigolds and other flowers are poured over the person becoming a monk by everyone in attendance, again beginning with the parents and elders, family and then friends. Some of the friends were a little merciless pouring small pitchers of ice water over them. After changing back into their robes and sarongs, the longest part of the ceremony began. Sermons were given about being a monk and making all the preparations. Saffron robes and pillows were blessed by the elders. Small metal fans holding three candles each were passed around the circle of elders several times, each person taking their turn to pray and then wave the smoke and flame toward the center of the circle three times before passing it on. More sermons followed, even the shaman stopped to take a swig of an energy drink. The sermon dragged on and on, the stifling heat wilting the lotus flowers. One part of the ceremony I had never experienced before (and have no clarification at this point about the symbolism) involved a pillar with seven layers created from bamboo. Each layer contained foods such as rice cakes and mangoes and bananas. At one point, the shaman took a coconut from the top layer and cracked it open, pouring the water into a glass. Then he took something from each layer and added it to the glass. The entire mixture was stirred and Chet and his nephew had to eat three spoonfuls of it. I can’t imagine that it tasted all that good. After what felt like hours, most of which I spent playing papparazzi taking pictures, a task which had been requested by Chet long before the ceremony, we had a chance to participate. Each person took their turn to tie a blessing string on Chet’s wrist. After the parents and elders and pretty much everyone else, it was our turn. Taking the string, you wipe it three times down the hand toward the fingers to take away any bad spirits or energy. Then wipe it three times toward the heart to give good wishes and spirits. Then tie it around the wrist using three knots. After struggling with my knots I am utterly impressed at the agility of the elder women with the crooked hands to tie them so adeptly. Dinner was a spectacular affair, the type of which I have never experienced at any of the monk ceremonies I have previously attended. More than just a gathering of friends and family for dinner and drinking, Chet did his ceremony with a flair that completely captures his persona with a full show. At one end of the street was a bi-level stage with a large poster for Chet’s ceremony as the backdrop. Tables and chairs filled the rest of the street, with the exception of an area for dancing. Food and drink flowed freely in a never ending train of people coming to and from the kitchen area like a trail of ants. At dusk, the show began. Words are failing me to fully capture all of the costumes and lights and the festive atmosphere. The dancers went through probably 10 outfits ranging from full length silk skirts and shirts typical of traditional Thai dance to short short sparkly dresses. The three singers took turns singing and engaging the crowd. The male performer kept calling me out, asking my name and where I was from and then calling me “amerika” the rest of the night. The pinnacle of the show was the lady boy performance of some traditional Thai dances that enthralled the crowd. Aided by a good amount of beer and whiskey, everyone danced. Chet’s sister, Khan, was dressed to the hilt in sparkles and insisted on dancing. Dancing to Thai popular music is not an easy feat. Eventually I got the hang of it, thanks to having done some belly dancing. Also helps if you know the song because each song seems to have an understood choreography that accompanies it. We were exhausted and headed back to the hotel around 10:30. The day had been long and tiring, even with a brief nap. I’m sure the party lasted well into the night when the last bottle of Chang and the last drop of whiskey had been consumed. The Sunday morning sun shone intensely as we began the final part of the ceremony. We danced our way over to the temple, women carrying the baskets of coin flowers and all the accoutrements needed for the ceremony, the band playing, people laughing and smiling. The procession proceed around the bot (main temple building) three times, occasionally pausing in the little bit of shade offered by a tree or the building. At the sacred stone in front of the bot, Chet and his nephew bowed, said some prayers and offered the lotus flower and the candles they had been carrying. In a mad throng they were then propelled forward by the crowd up the steps of the temple, symbolizing the support of the community and family of their service as a monk. Prior to a monk ceremony, hours and hours of work by friends and family go into making “coin flowers”. These intricately folded flowers contain some amount of money in the center, typically 1 or 2 bhat. The 365 that I had folded over the course of the past 6 months was a small drop in the ocean of coins that were there. So as Buddha gave away his wealth and worldly possessions, the coin flowers are thrown out to all the people there for the ceremony. Madness ensues. Caught in a barrage of coins pelting me and small children at my feet furiously gathering as many coins as possible, I tried to take some pictures and to catch one myself (for good luck.) Eventually I was able to extract myself from my spot and try to take a few more pictures out of the range of fire. At the very end I think that one man thought I didn’t catch any and so he gave me one of his. While Chet went through the remaining part of the ceremony with only his family in attendance, we sat outside and tried to not melt. Eventually, the ceremony was complete and Chet and his nephew emerged as monks in their saffron robes. As they stood at the doors of the temple everyone lined up to make an alms offering. Placing some money or other offering in their bags and paying respect. The whole ceremony ended with lunch. While the monks ate, we sat and waited. When at last they were done eating and had filed out of the food hall, we were served lunch. While we were eating the head monk came back in. He was worried that Deborah, Jonah and I were not going to be able to eat because the food might be too spicy for us. He also decided we needed mangoes, so he had the women cut up about 8 mangoes for us (by far some of the best mangoes I have had in a long time.) Then he decided we each needed our own green mango to take with us. He was happily surprised when I actually held up a plate to take mine from him as monks cannot hand anything directly to or take anything directly from a woman. He also decided we needed some fresh crysantheum tea and brought us those as well. After we were done eating and ready to leave, we went and paid our respects and he sent us off with chok dee (good luck) and many happy smiles. And so Chet begins his 7 days as a monk. Being a monk in Thailand is not a forever commitment, unless that is their choice. All Thai Buddhist males are expected to be a monk for 3 days up to 3 months. Serving as a monk honors the parents and creates good karma for the family. And I was honored to be part of one of my dear friend’s ceremony.